Certainly one of the biggest objections to measuring performance is the amount of time and effort it takes to do it properly. Executives, managers and staff alike somehow believe that it should be fast and easy, a trivial task they can just ‘get out of the way’ and go back to their ‘real work’. It’s because they believe in the same BIG lie. The lie is that what they are doing in their ‘real work’ is more important and more urgent than measuring performance. They believe that performance measurement is NOT real work. They see it as a bureaucratic hoop you have to jump through and get done with as quickly as possible. 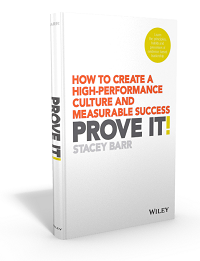 How do you help someone value performance measurement? IDEA #1: Make it about fixing a problem, not measuring for measurement’s sake. If customers aren’t satisfied with something, simply bring measurement in as one of the tools you use to fix the problem, and not make a big deal out of it. IDEA #2: Use just one measure to tell a story about a problem that is bugging people. Tell that story to those who care, and let the measure become a catalyst to discuss ideas for getting better results. IDEA #3: Reveal how much time and money they are wasting, due to processes that aren’t working well and aren’t measured well. Choose one process, and a measure of the bleeding, and a measure of the process. IDEA #4: Help them understand why time and effort is needed to do measurement properly by exploring the struggles they might not realise they have, that are simply the consequence of doing measurement badly. IDEA #5: Create an ROI measure of the time and money to do measurement properly, relative to the time and money that is saved or created by using measures to improve processes. Start small. That’s the biggest mistake I see people making is trying to do too much too soon to get people to measure performance. They end up killing their momentum with overwhelm. Do not try and implement performance measurement fully; not for a team, not for a department and most definitely not for the organisation as a whole. Start with a single performance problem only. 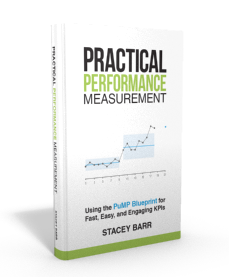 Your first goal in helping people value performance measurement is to show them how it helps them get what they want, sooner and more easily. 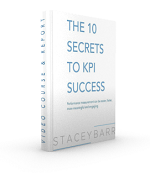 In time you’ll be able to show them that the time and effort that goes into measurement is a mere fraction of the time and effort they are wasting in pursuit of what matters most to them. What is a real problem that you could use to build a compelling story about how performance measures save more time and effort than they cost?